I always wanted to climb atop Lion’s Rock as I could view a mound of that rock from my residence on Hong Kong Island and finally on Tuesday 9 of us hiked up this trail. Difficulty: many have rated it 7/10 but I would rate it 8/10 as it is steep but yes we saw tiny tots hiking up too so mostly it depends on stamina and fitness levels. How do we get there: we took the train to Wong Tai Sin MTR and exited at exit B3 from there we took a cab to the lions rock country park since it is a 1 hour walk from station to the Shatin Pass Road from where the trail starts. You can also take the mini bus 18M and then walk up 15 minutes to the start of the hiking trail. And climbing we did it’s steep …yes nothing compares to Lantau but this hike is not for the faint hearted. We hemmed and hawed as we climbed . But what beautiful sights. It wasn’t the clearest of days being the middle of winter but still amidst the fog there was beauty. We decided to go up Beacon Hill. We finally came to a part of the lion rock trail . 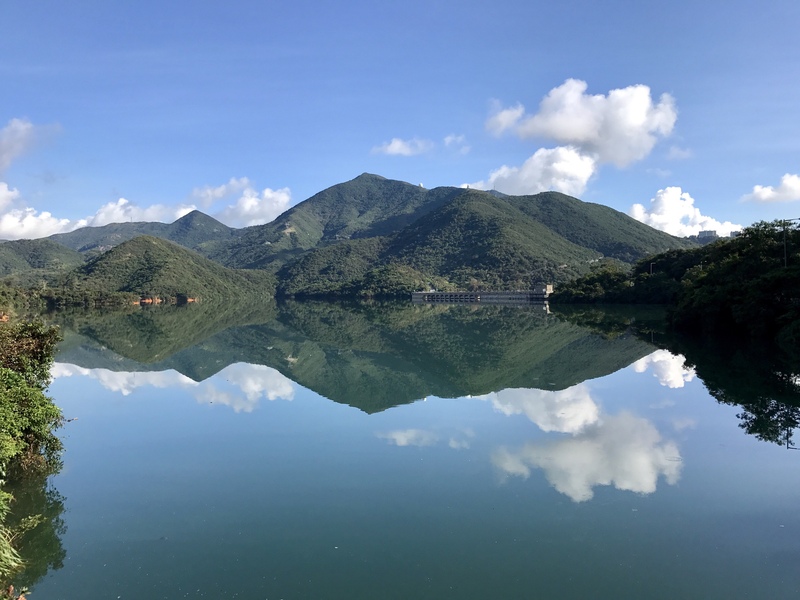 This connects to the Maclehose Trail which took us to an elevation of 495 mts. And we climbed the first bit. We climbed down to reach the peak on the other side. This looked difficult but wasn’t but yes it is risky. But it gives you an adrenaline rush climbing up that peak. And here we all are. We enjoyed some hot Indian masala tea atop this peak . What fun! And then we had to go down the same way 🤪. We all had to jump down like apes literally. Climbing was similar …not surprised after all we have evolved from them too. 😁. We then took a turn around the peak instead of going back the same way we came. Adventure got the better of us. Lovely views from the top though. That was the board we came across when we reached a part of the trail. However we walked past it and decided to carryon walking. Found this shelter on our way and this man sweetly smiled for me. We came across these remnants of the war on our way down too. And again we climbed till we reached Beacon hill viewing point. Finally we came to this part which stated that this was Maclehose stage 5 war relic part. We continued down the concrete path after the beaten track down Lung Yan Road. We came across some monkeys along the way . And a little ahead we found a mobile toilet. Fishtanks were seen while we walked down the road. Came across this funny guy along the way. We then took a bus to Wong Tai Sin MTR from the bus stop which was to the right of this sign board. What a lovely , satisfying feeling it was!! We covered Lions rock and Beacon hill and would have coveted over 10 kilometres on this trail. Climbing Lions Rock is not easy . If you’ve not hiked before then please do not start with such a hike. Carry loads of water and energy bars or fruit with you if you need that boost to climb up . To each his own. Let’s just say this Lions Rock is for the Lion Hearted 😁.